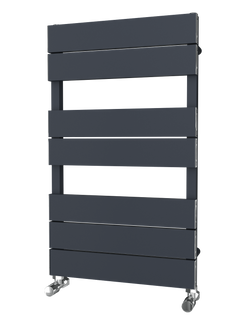 The DQ Liana Towel Radiator is the ultimate in simple design. 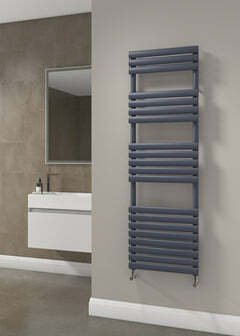 A really versatile towel radiator in a high quality stainless steel. The DQ Liana is available is three widths and five heights, giving you plenty of options. The Liana electric option comes with a standard element that is fitted to the right hand side of the radiator. 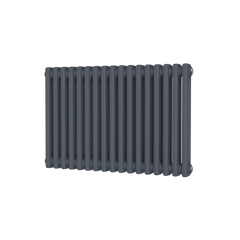 The Radox Premier Flat Horizontal Towel Radiator is one of the finest towel radiators in any price range to be found in the UK. This European manufactured product has fully TIG welded ends which eliminate the likelihood of pin-hole leaks and prevent crooked tappings. The Premier Flat is a lovely product and would look great in any bathroom. The Radox Premier Flat Horizontal is available in Chrome or White. The Reina Cavo Stainless Steel Towel Radiator features a lovely asymmetrical design. It has stunning thick rails and good spacing for keeping towels and clothes nice and warm. The Reina Cavo is made out of luxurious stainless steel and would look great in any bathroom. The pipes can also be handed on the left or the right to suit fixtures. With long fingers extending outwards from its supporting columns, the Florina makes and excellent bathroom piece which wouldn't look out of place anywhere else in the home. The DQ Cove Stainless Steel Towel Radiator has lovely rounded oval tubes, which makes for a very stylish design. The DQ Cove STR would make a fantastic addition to any bathroom or kitchen. With a 25 year guarantee this radiator is a sensible choice. The Radox Premier Flat Towel Radiator is one of the finest towel radiators in any price range to be found in the UK. This European manufactured product has fully TIG welded ends which eliminate the likelihood of pin-hole leaks and prevent crooked tappings. It is a simple yet elegant design. 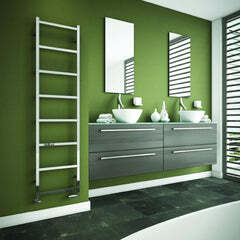 The Radox Serpentine Towel Radiator invites a creative and elegant design that would fit in any bathroom or kitchen. With plenty of hanging space and stunning good looks, this flowing river of warmth will be everything you need for your environment. This is a lovely product and would look great in any bathroom or kitchen. The Radox Serpentine is available in either stainless steel, or a chrome finish. Guaranteed by Radox for 25 years for Stainless Steel, and 10 years for the Chrome option. The Reina Elisa Designer Towel Radiator features a lovely asymmetrical design. And has spacing for keeping towels and clothes nice and warm. The Elisa would enhance any bathroom or kitchen. The Reina Elisa is crafted out of stunning chrome.